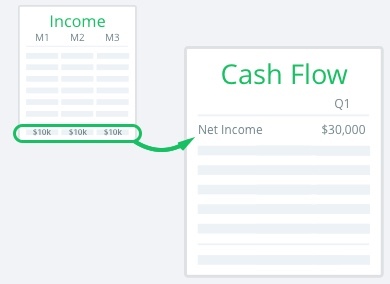 The cash flow statement is the most important financial document you're probably ignoring. It's like the red-headed stepchild of financial statements (apologies to red-headed stepchildren). In my experience working with small businesses, there tends to be more emphasis on the other two financial documents: the income statement and balance sheet. However, the cash flow statement is equally important because it tells us what's happening to the money in our bank account. It describes in detail how money is "flowing" in and out of the business. You may be thinking: but isn't that what the income statement tells me? As we'll soon discuss, there are many reasons your income statement may be misleading. The cash flow statement is the go-to document for figuring out whether you can afford new loan payments, investments in equipment, hiring new employees, and much more. Many of the questions you'll face from loan officers, and investors are answered directly from the cash flow statement. How much money do you need? What's your burn rate? How will they get paid back? 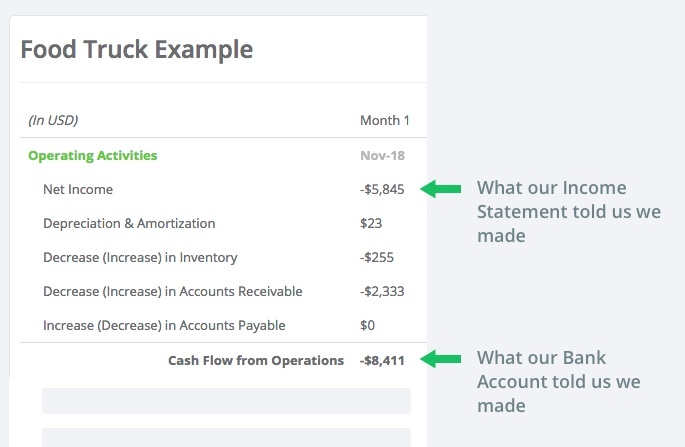 The cash flow statement allows you to provide intelligent answers to these questions and empowers you to make business-altering decisions with greater confidence. My purpose in writing this post is to teach you how to think about the cash flow statement as a manager, not to define mechanical procedures. This approach is much more helpful when facing the most important decisions your business encounters. The cash flow statement is a product of the activities contained in the income statement and balance sheet. It combines the "hidden events" captured in both documents to illustrate what's happening to our bank account. 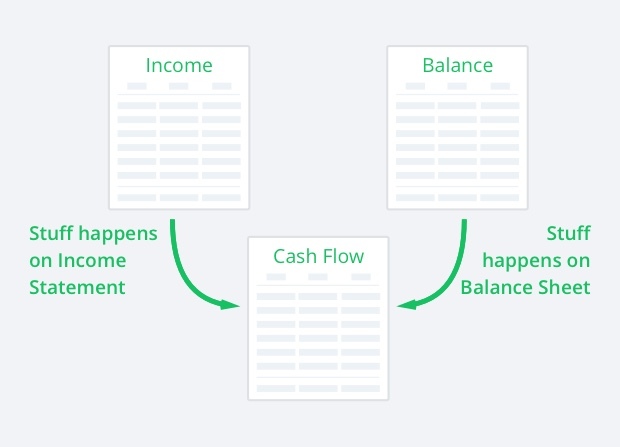 Your cash flow statement reveals where cash is coming from, and how it's used. Consequently, it provides relevant information on the company's quality of earnings and resulting solvency. 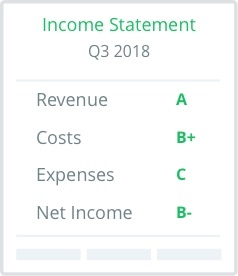 Think of the income statement as a financial report card your business brings home every quarter. It tells you how the company performed over a specified period (lagging indicator), but it doesn't tell you whether the business is cheating on tests (possible leading indicator). As you might imagine, cheating isn't a great long-term strategy, and it's safe to assume the quality of current performance will have a significant impact on future success. Recognizing revenue early works excellent for tax collectors, but it's not super helpful as a management device. We can go weeks, or even months, without collecting the money. The time between earning revenue and receiving the money is a large part of what creates the need for your cash flow statement. To illustrate: If you just invoiced a customer for $1M, but they're already 60 days past due on their last two invoices, your income statement will look great, but your cash flow statement will be screaming for help. Luckily these rules also apply to costs and expenses. Spending money on credit can help offset the timing discrepancy with revenue, but it also adds further complexity to the cash flow picture. The balance sheet is like a photograph of everything your business owns and owes at a specific point in time. Unlike the income statement, which covers a span of time, your balance sheet only tells you the size of the business during the moment a "photo" is taken. The ephemeral nature of the balance sheet makes it difficult to know precisely what took place between two "photos." We might notice fluctuations in the individual accounts, but it's not clear how these fluctuations allow your balance sheet to slip its hand into your wallet and grab some lunch money. Thankfully, the cash flow statement captures everything that's happening behind the scenes. It'll show you exactly how the balance sheet is using or producing cash (none of which shows up on the income statement). 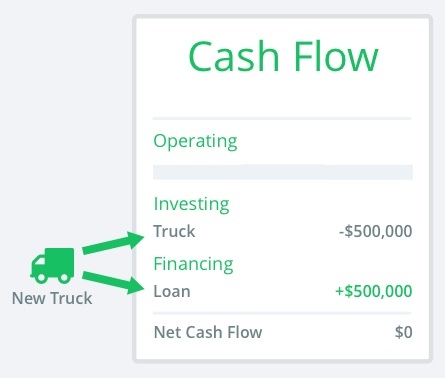 Before we begin the magical journey of breaking down each section, it's helpful to understand a few things about how the cash flow statement works. Cash inflows are positive numbers, and cash outflows are negative. Simple enough, right? This little fact helps us understand the relationship each line item has to the bank account. Outflows reduce the amount of money in the account, and inflows add money. 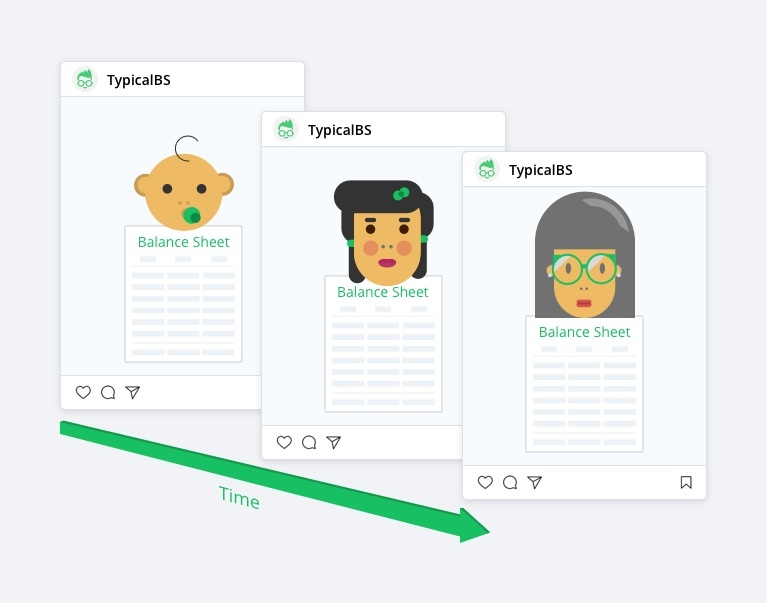 The fact that the income statement and balance sheet differ in their treatment of time (report card vs. photo) means we have to use different methods to combine them on the on the cash flow statement. As the income statement covers a period of time, the line items originating from the income statement are merely the sum of that item over the preceding period. Example: if net income was $10,000 each of the past three months, then our quarterly cash flow statement would show $30,000 for net income. Example: if you have $10,000 of inventory on your balance sheet at the beginning of the period and $12,000 at the end, then the value on your cash flow statement will show -$2,000 since you bought more inventory. As you can see, buying more inventory decreases cash on hand. It also demonstrates how cash flow from your balance sheet is simply a function of fluctuations, which would be harder to analyze looking at the balance sheet alone. As we discussed above, positive and negative values reflect which direction money is flowing, but it doesn't explain the reason specific values increase, while others decrease. This connection isn't always straightforward. Example: Increases in Accounts Receivable decrease cash. Even though growing receivables can be an excellent sign for growing businesses, we have to adjust cash flow for the fact that we've reported these receivables as revenue on the income statement (it was earned but not collected). Question why specific line items increase or decrease when they do. The answers provide a much deeper understanding of how to interpret the performance reported by the other two financial documents. 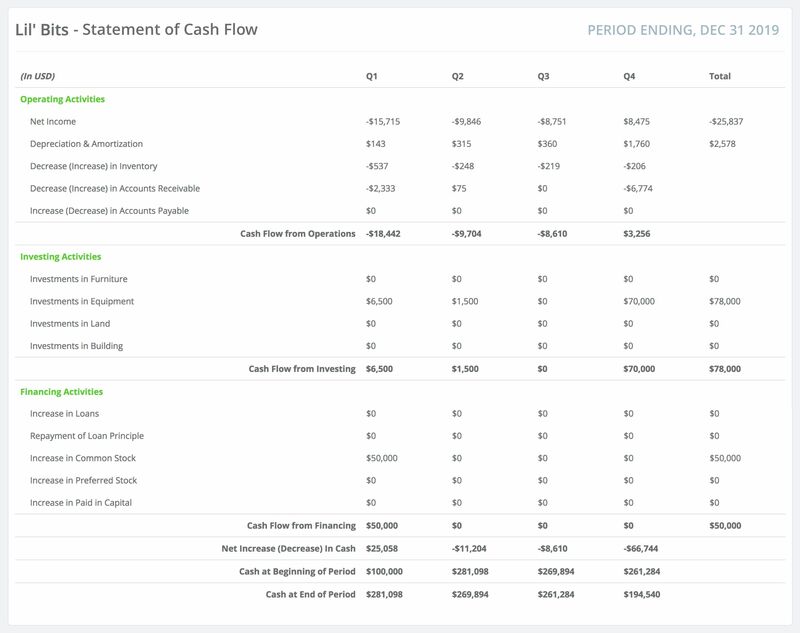 Now that we have the basics down, we can dive into each of the three sections of the cash flow statement and understand what they're telling us. Operating cash flow tells us how much cash the core business is generating from revenue related activities. It contains line items from the income statement and balance sheet and reflects the general health of your daily business. Investors and bankers love this section because it tells them your capacity to create value and pay them back (obviously, there are some caveats in the tech world). Let's say you're manufacturing widgets. The material costs associated with producing your product would then be considered a regular part of daily business. Purchasing a new manufacturing facility, however, would fall outside the realm of normal "Operating Activities" (we'll get to that later). The difference between total operating cash flow and net income tells us just how much the income statement can be misleading our ability to make sound financial decisions. Cash flow from operations is typically presented using one of two methods: Direct or Indirect. The primary differences are the level of detail they convey, and the starting point they use as the basis for calculating operating cash flow. The odd thing about the indirect method is that we start with a line item (Net Income) that isn't truly a measure of cash flow. As a result, we have to use the other line items in the operating section to adjust net income. This "indirect" procedure for calculating cash flow is where the method gets its name. A benefit of the indirect method is that the line items directly relate to the other financial statements. This makes it better for teaching purposes, and easier to calculate. You can clearly see how the other two statements affect cash. 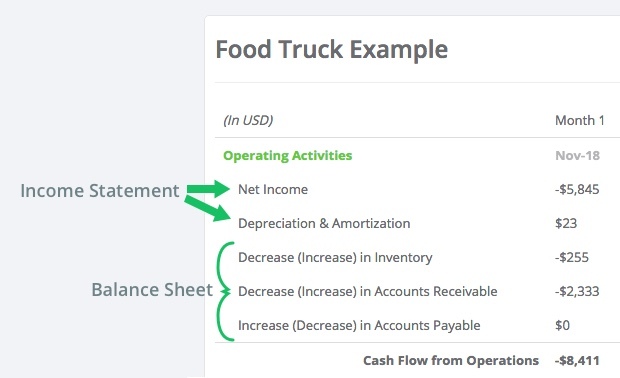 The direct method calculates cash flow by the types of transactions taking place. We may see something like "Receipts from Customers" as a starting point, which is a "direct" measure of cash flow, unlike net income. Consequently, the direct method provides more detail about how cash is moving through the business. This characteristic makes it the preferred method of standard-setting bodies like the Financial Accounting Standards Board (FASB). With either method, you'll arrive at the same result, so the one you choose should largely depend on its utility as a decision-making tool. 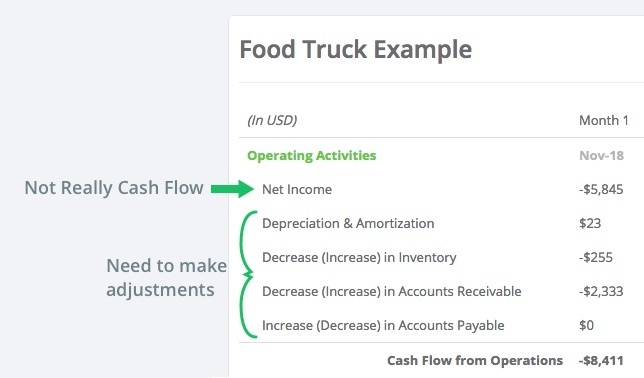 How you interpret cash flow from operations can vary depending on factors like industry, business model, and stage. 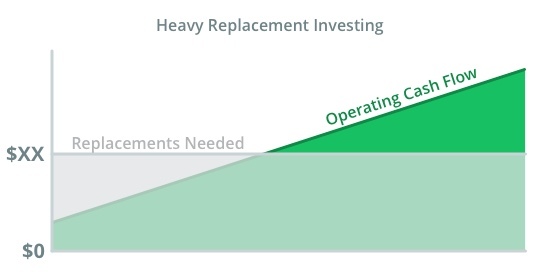 Startups may expect multiple periods of negative operating cash flows while larger, more established companies decide how to reinvest the excess money. You'll want to pay extra-special attention to this section if you have significant levels of working capital (i.e. balance sheet items). If you're generating positive cash from operations, then you should be thinking about what you’re going to do with the money. A failure to budget the money effectively can indicate a lack of direction from leadership and shrinks prospects for future growth. Top of mind concerns for investors and lenders. For companies experiencing negative cash from operations, your response will depend on an understanding of why this is happening. New businesses understandably have negative cash flows early on. They have to invest in people, processes, and activities that don't provide immediate income. In this situation, it's important to keep an eye on the burn rate and understand how long it takes to reach positive cash flow. Established businesses may have more complicated reasons driving negative cash flow. It's of vital importance that you understand the factors driving this trend. Only then can you start to develop hypotheses for potential solutions. For instance, if customers are taking longer to pay, it could indicate a general slowdown in the market, which should factor into decision-making concerning inventory orders, hiring new employees or any other financial decisions. Addressing the immediate concern might include dedicating more resources to collections or establishing new payment processes. If we can rule out one-time, or temporary causes, negative operating cash flow may also indicate a much more significant issue. A broken business model. Clearly, this would be a much more challenging hurdle to overcome. Did direct costs increase too much to support current pricing? Is a competitor stealing market share? Answers to these questions will require more significant resource mobilization. Once you become a cash flow master, you'll see how answers to these existential questions may already be included in the Investing Activities section. Cash flow from investing activities includes money spent, or earned, by purchasing or selling long-term investments (balance sheet items). This section tells us whether the company is making investments that are expected to produce future income. If you're Tesla, and you want to increase production capacity and deliver more vehicles, your purchases of property, plant, and equipment would all be classified as investing activities. Investments are separated into two categories: Additions, and Replacements. Replacements are investments made to upgrade obsolete assets. This is the base level of investment a company must make to maintain its current size. Replacements may improve productivity, but they shouldn't be expected to generate substantial future cash flows relative to additions. Additions are investments that expand the company's balance sheet. They should substantially improve future cash flow. The investments Tesla made in our example above would fall into this category. Investing activities are particularly crucial for capital-heavy industries, such as manufacturing which may require the purchase of expensive equipment. It's important to pay attention to the distribution of investing activities between additions and replacements. If a company is making replacement investments, we can assume they will be able to maintain the current level of business, and possibly make incremental advancements. Alternatively, if a company chooses to forego investing in replacements, it will be harder to compete with the higher quality and efficiency of companies purchasing newer equipment. We can further assume the business will necessarily decrease in size as old assets depreciate off the balance sheet. This makes replacements an early indication of the health, and strategy of the business. Additionally, if management is selling assets to generate positive cash flow from investing activity, we should immediately get to the bottom of the reasons for the trend. Is management generating cash to pay down other obligations? This could be a very troubling sign. Are they changing some aspect of the core business to adapt to new realities? This could indicate foresight on behalf of management, which may improve prospects for future growth. 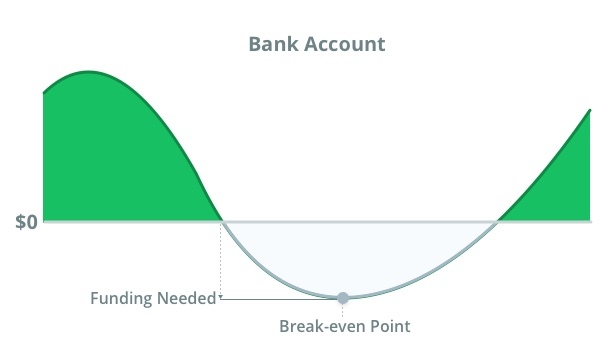 Heavy replacement requirements also have the effect of raising the bar for your break-even point. If your business requires substantial investment to stay competitive, you’ll need to generate enough cash from operations to cover the financing needs for new replacements. Ultimately, the thing to recognize here is whether the business is investing fast enough to replace old assets. If not, find out why. Management will often do extensive research and analysis on the expected ROI before making any investment decision. Once an ROI is understood, it’s best to compare alternative investments to make sure we’re putting money to use in the most effective manner. Something we call comparing the "opportunity costs." A vital component of this recipe is the ability to finance each option. Can you use cash from operations, or are you going to utilize the next, and final section of the cash flow statement? Alas, we arrive at the final section of the cash flow statement: Financing Activities. 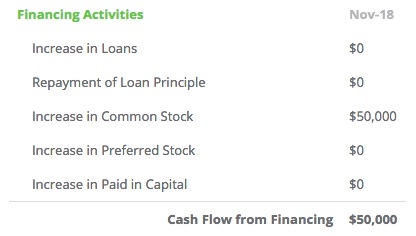 This section relates to cash flow from transactions between the business and financing sources. Specifically, shareholders and creditors. Loans, equity investments, and dividend payments (among other things) are all financing activities. This is where we source, or use, cash from other parties. For instance, if we take out a loan to purchase new equipment, the loan amount would show up as a cash inflow. The individual payments we make to pay the loan off will show up as cash outflows. Positive cash flow from financing activities indicates we're receiving money from third parties. Cash outflows may represent the repayment of debt, cash returns for investors, or other uses. It's important to remember that Financing Activities, much like the other sections, should not be viewed in isolation. Companies don't just take out loans or raise money from investors so they can leave it sitting in the bank -- generating nearly zero interest. Outside capital should generally be used to finance a shortfall in some strategic initiative the company is pursuing. All of this means financing activities will often relate to corresponding investing activities. The loan we just mentioned for purchasing new equipment would affect two separate sections of the cash flow statement. It would show a cash outflow to buy the equipment, but it would also show an inflow from the loan to make the purchase. They would cancel each other out and result in a neutral effect on cash flow. The payments for the loan would then show up as cash outflows over time. This won't always be a case, but it's the clearest example of how financing activities are often used to drive investing activities. By now this should be no surprise. The place to start is to assess whether we see trends in outflows or inflows. We can then begin to ask questions and dig into the reasons behind the trends. Outflows typically represent two general themes. One theme is the company is using cash to provide returns to shareholders. We usually see this in mature businesses where prospects for growth may be limited. Ultimately, this means the company is choosing to give investors cash returns today instead of investing in profit generating activities that pay off at some later date. They might decide to do this because the opportunity costs are less attractive than giving the shareholders money. Another significant reason for cash outflows is the repayment of debt. Hopefully, this debt was used to finance previous growth initiatives, and is currently, or soon to be generating returns. Debt payments have the effect of adding another hurdle for cash flow break-even points. We'll have to create enough cash from operating activities to cover these payments, or else we'll need other sources of funding to do so (terrible sign). The tricky part about debt repayment is that it doesn't show up on our income statement. Only the interest payments on debt are tax-deductible. Principal reductions are hidden under fluctuations in the balance sheet. This means the cash flow statement is even more critical for companies with significant debt levels. Debt payments add what amount to fixed costs the company must cover through operating cash flow. Cash inflows are more closely aligned with future investments and growth. Companies raising loads of money today are likely to invest that money in expanding the business. The important thing is to make intelligent decisions around high potential investments. Otherwise, we may end up in a situation where the company doesn't grow much and takes on burdensome debt levels. All the principles, sections, relationships and implications we just covered ultimately result in 3 simple little lines. The first one is the "Net Change" in cash. This is simply the sum of all cash flow effects from our operating, investing and financing activities. It tells us whether we added money to the bank account or whether the balance decreased. "Beginning Cash" is the amount of cash your business has at the beginning of the month. You might notice that it's the same number as the figure in the bottom left from the previous month (pictured below). This is because last months ending balance is the current months beginning balance. Each month is linked to the next, and the cash flow activities we covered above take place between the beginning and ending balances. Lastly, our "Ending Balance" is the amount we have in the bank at the end of the period (Assuming we only have one bank account). Typically, we want a positive value in this row. If it looks like the ending cash balance will dip below zero for any reason, find out how much you'll need to cover the expected shortfall and start your financing-activity-hustle.